On a walk along the rocks under the South Foreland chalk cliffs near St Margaret’s Bay, Kent on, Boxing Day 2005, this interesting object was found by William Stephen Burville close to the base of the cliff. Have you any ideas about its use – such as fishing weight, handle or ceremonial axe-head? Various learned institutions have not been able to help on the item's identity. It is made from a black stone (not flint), which appears to be sedimentary in nature having layers, and probably had not been on the rocks that long as there appears to be very little wear or damage done to it. Wave-action can have a serious impact on the most sturdy of materials! The latter point suggests it arrived on the rocks recently via a cliff fall, rather than from the sea, unless it was washed out of a shipwreck not long before it was found. The physical dimensions are: Length 124mm, Width 53mm tapering down to 32 mm, Depth approx 18mm, weight approximately 250g. 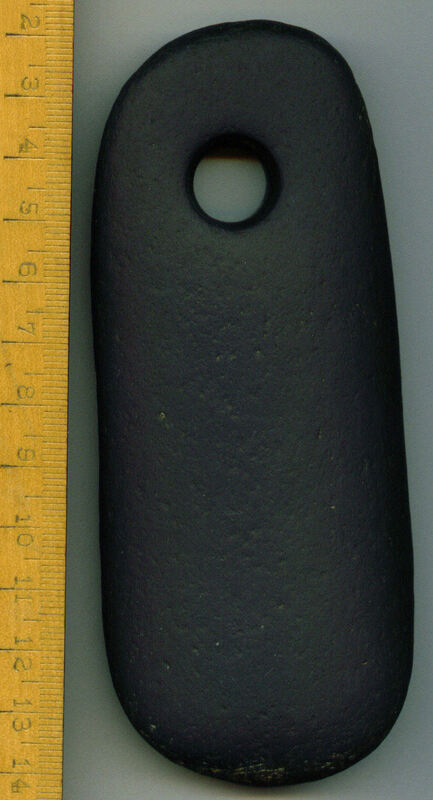 The hole through the item appears “perfect” on the “flat” side but worn on the “fat” side, hence the thought it might have been used as a handle turning a shaft. It may have been a fishing weight or a knife-sharpening hone attached to the owner's belt through the hole.